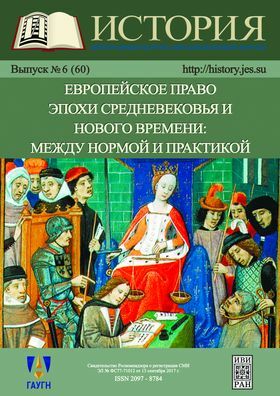 The articles included in this issue show the current state of research on the history of law in the Middle Ages and early Modern period, mainly in the study of the complex and ambiguous connection between the concepts of “norm” and “practice”. The authors focus on the diversity of legal norms that existed in this period, on their discrepancy, not only with each other, but sometimes with more general values of people of that era, especially Christian values. The research experience of historians shows that studying this topic is obliged to take into account the heterogeneous and multi-component bulk of sources and each time to re-solve the question of what exactly in this particular case should be called “norm” and what is “practice”. The basis of our thematic issue was the presentations given at the Olga I. Varyash Memorial conference “The connection of times, phenomena and people”, held at the Institute of World History of the Russian Academy of Sciences in October 2016.